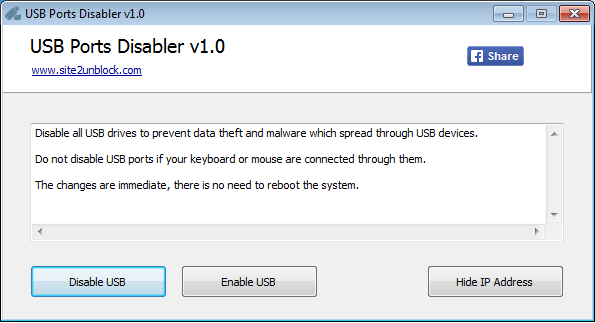 USB Ports Disabler is a simple Windows OS software useful to disable all USB drives to prevent data theft and malware which spread through USB devices. Easily lock or unlock USB ports, restrict users from using USB drives in your computer, disable USB drive detection on your Windows system. This program works by disabling the USBSTOR service so Windows is unable to detect and identify USB devices connected to the computer. USB Ports Disabler works on Microsoft Windows XP, Vista, 7, 8, 10 (32\64-bit).